It’s a pretty poorly kept secret by now that I’m a total deck fiend. I managed to keep it in check for a long time, but after I started writing Tarot, I have an excellent excuse to indulge myself more often. Even so, I do try to make considered choices, and The Psychic Tarot Oracle Deck by medium John Holland is one I looked over a few times before I purchased it. I mean, yes, the artwork is very nice. That’s always the first thing I look for in any deck: is the artwork engaging and communicative? The more the art speaks to me, the better readings I’ll be able to do with the deck. This one passed the artwork test easily. But it bothered me some it is a “Tarot Oracle” instead of a standard 78-card deck. I like oracle decks as well, but figured a combination of the two means it may do neither well. I wasn’t sure exactly what I was going to get. Make up your mind about who you want to be, eh? The author uses suits of Spirit/Purple Border (Fire/Wands), Physical/Red Border (Earth/Pentacles), Emotions/Green Border (Water/Cups), and Mental/Indigo Border (Air/Swords). Majors are bordered in black. The color choices for borders of each suit confused me at first. (Okay, they still do.) I suspect he was looking to link the colors to charkas, especially given he’s added cards for each of the seven chakras. Essentially, this deck is somewhat geared to teach the author’s process for reading. That’s not necessarily bad—studying different methods is a useful practice. But if you’re only interested in more traditional Tarot work, turning over a Chakra card may prove annoying. What is NOT included is the court cards or, oddly enough, the tens of each suit. No explanation of the rationalization for this decision. There is an included guide that’s somewhere in between Little White Book and full size companion book status; enough to explain the card meanings with black and white images and provide the obligatory “this is how you read the cards” stuff. The author suggests this deck isn’t intended to make use of inverted cards. Suggested interpretations were okay, but felt like far too much hand-holding for my tastes. The cards are slightly over-sized—not enough to make them difficult for me to hold, but if you have small hands, you may find them awkward. I like over-sized decks sometimes, because they feel good to manipulate and are easy to examine in detail. The edges have a beautiful, gilded gold finish and the stock is good quality. The cards in my new deck stuck together some, no doubt because of the gold edges. So go through and make sure there aren’t any hiding. I found un-sticking them is a reasonable price to pay for the extra sparkle, though. I love me some sparkle! This would make a nice change-of-perspective deck when you’re feeling a subject has become stale with your go-to deck. It could also be a nice study deck, either for someone new to reading (and not ready to tackle the courts yet), or anyone who would just like to see some old friends in a new light. That’s how I’ll often be using it. One of the reasons I enjoy working with different decks is the perspective and nuance each offers because it leaks into your work with other decks as well, making all of your readings richer. A random sampling of cards below. Y’all like this deck? Anybody have it? Seeing the Zodiac Tarot Deck by Lo Scarabeo, I was immediately drawn in—must have been the adorable baby on the box (the Sun). Since this deck is constructed specifically around astrological correspondences, it occurred to me it could be a great crossover deck for astrology fans to learn Tarot, or Tarot fans to learn the cards’ astrological correspondences. Either has the potential to broaden your perspective and thus improve your readings. The Zodiac Tarot starts from the Golden Dawn‘s correspondences, adding in the modern planets; the Golden Dawn itself was a synthesis of many mystical orders and spiritual traditions; their teachings were basis for the well-known the Rider/Waite and Thoth decks. But while the astrological associations are included in Rider/Waite and other well-known decks, many other traditions are also integrated, making it difficult at times to discern the astrology from the other symbolism. That’s why the astrology connections to some cards can be inconsistent and confusing. The Zodiac Tarot, however, focuses solely on the astrology. Thus, you’ll see both similarities and deviations in focus for individual cards from traditional decks. The astrological interpretations are modern as well, as opposed to the Victorian interpretations that would have been in use by the Golden Dawn in the 19th Century. The suits are Torches (Wands/Fire), Waves (Cups/Water), Clouds (Swords/Air) and Stones (Pentacles/Earth). 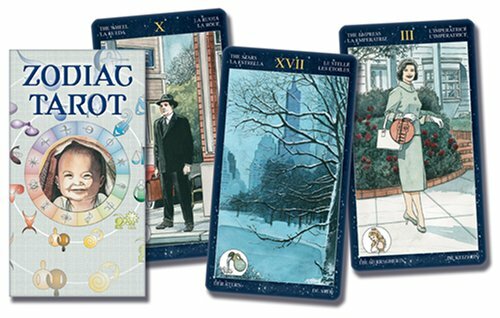 The Zodiac Tarot also has a much different feel than other decks, using more modern imagery. Sort of modern, that is. Artwork is reminiscent of the fifties and has a definite charm, depicting home/dixiblog/domains/afoolsjourney.com/public_html, family, and everyday scenes. Each card has a small icon at the bottom to identify the astrological association. The illustrations are engaging and evocative. The Devil Card (Capricorn), for example, is illustrated by a prison cell. While the traditional Devil card can (and often is) read as imprisonment, the old school illustration doesn’t give the same immediate understanding of restriction and consequences as the prison cell image does. Death is illustrated by a submarine. The Little White Book (LWB) included suggests this: “Death/Scorpio. Place: the Submarine. Death and birth. Secrecy. Deeply hidden feelings. Primal instincts.” Probably a lot less scary to non-readers who see the card come up in a reading. The LWB includes the history of the deck, how the associations are constructed, and very brief suggested interpretations. While I normally ignore LWBs, in this case, I’d suggest holding on to it, at least until you are sure you can easily identify the planetary and elemental icons. Otherwise, you may find it confusing to identify some of them. It also will clue you in to some symbolism you may have missed, like the time of day indicating whether a card is Cardinal, Mutable or Fixed. I use this primarily for study and personal development, but have no doubt it would give interesting readings. I would have preferred to have a visual cheat-sheet for the icons, but alas, no such luck. And my old eyes could have used some bigger print in that LWB. But overall, I found this to be a very nicely done deck that has the potential to expand my understanding of astrological correspondences to the Tarot. Do you combine Astrology with Tarot work?